Gosh this Isetan Newsletter reminds me of my heydays shopping like mad there *face palm*. 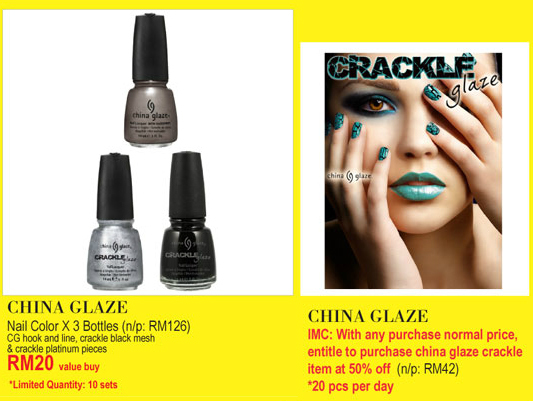 Also reminds me that I have a review post on China Glaze's debut in Kuala Lumpur that needs to be up soon! been sitting on it for like *face palm*. I promise to get it up!!! but just a little introduction to China Glaze, it's not nail polish from China yeah?! it's because their nail lacquer contains China Clay as a nail hardener which gives their polish a shiny finish! Fri - Sun 20th : PWP promotion! 2nd bottle at 50% Off! For over 13 years, China Glaze has exceeded the bar set by the professional nail care industry. We are dedicated to providing the highest quality of globally rich, on-trend, innovative colour lacquers and treatments. Our colours provide the perfect accent to any individual style. From our neons, to reds, corals, to shades of blue, our colours' inspiration is found on the shores of Tahiti, the nightlife in New York City, and beauty within every woman. Our unique lacquers contain China Clay as a nail hardener, the same material that gives porcelain its shiny finish. These glossy lacquers work in perfect cohesion with our professional nail treatments for lasting strength, durability and overall gorgeous nails. Need stronger, longer nails? Try our Nail Strengthener and Growth Formula. Want softer Cuticles? Check out our Orange Cuticle Oil. Looking to prevent chipping and peeling of your favorite colour? Our No Chip Top Coat is for you. For a flawless application every time, use our quality formulas with our optimized 440-strand brush. Nothing says the perfect nail like China Glaze. 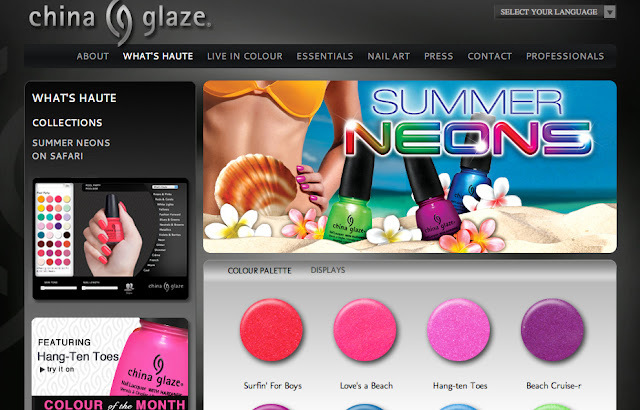 *All China Glaze colours are free of DBP, Toulene and added Formaldehyde. here, you get yourself a little little bit of everything.